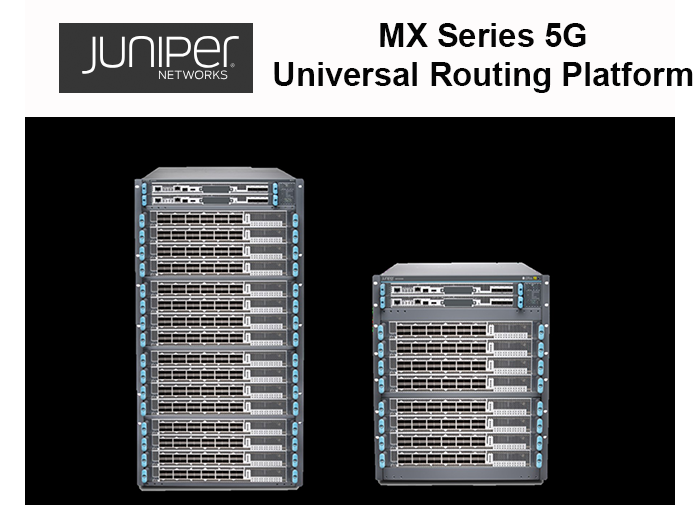 Juniper Networks introduced its new MX Series 5G Universal Routing Platform powered by a new generation of its custom ASICs promising extensive programmability and performance improvements for supporting resource-intensive applications like 5G and secure SD-WAN-based managed services. The new "Penta" silicon, which leverages 16nm geometry, functions as the packet forwarding engine for the MX series. It delivers a 50 percent power efficiency gain (0.5 watts per gigabit) over the existing Junos Trio chipset, which leads to a 3x bandwidth increase for the MX960, MX480 and MX240. Juniper designed the Penta silicon with native support of both MACsec and an IPsec crypto engine – an industry-first – that can originate and terminate thousands of IPSec sessions without sacrificing performance. Additionally, Juniper Penta supports flexible native Ethernet support (FlexE). A second major innovation with the platform is open hardware-accelerated 5G Control and User Plane Separation (CUPS), which enables operators to separate the evolved packet core user plane (GTP-U) and control plane (GTP-C) with a standardized Sx interface. This allows service providers to scale the control plane and the user plane independently as needed for added flexibility and investment protection. 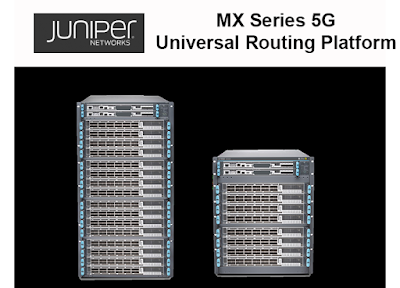 Juniper said its MX Series 5G platform is the first networking platform to support a standard-based hardware accelerated 5G user-plane in both existing and future MX routers to enable converged services (wireless and wireline) on the same platform while also allowing integration with third-party 5G control planes. Juniper expects this will lower total cost of ownership by as much as three to four times over software-based user plane implementations for MXs deployed in the field. In addition, the rollout expands Juniper Universal Chassis system. The previously announced PTX and QFX Universal Chassis gains two new MX variants: MX10008 and MX10016. The 13-RU MX10008 and 21-RU MX10016 Universal Chassis bring industry-leading and space-saving scale for edge routers at 19.2Tbps and 38.4Tbps, respectively. The MX10008 and MX100016 will be available during the second half of 2018. Juniper Penta Silicon-powered line cards for the MX960, MX480 and MX240 will be available in Q1 2019. New CUPS support will be available in the first half of 2019. “Cloud is eating the world, 5G is ramping up, IoT is presenting a host of new challenges and security teams simply can’t keep up with the sheer volume of cyber attacks on today’s network. One thing service providers should not have to worry about among all this is the unknown of what lies ahead. That’s why we’ve continued innovating our flagship MX platform to deliver more speed, flexibility, programmability and security capabilities, giving our customers the peace of mind they need as a variety of demands continue to put pressure on the network,” stated Manoj Leelanivas, Executive Vice President and Chief Product Officer, Juniper Networks.